Prominent & Leading Manufacturer from Pune, we offer Thermal Paper Rolls, POS Thermal Paper Rolls, Blue Thermal Paper Rolls, Green Thermal Paper Rolls, Colored Thermal Paper Rolls and Pink Thermal Paper Rolls. Our offered Thermal Paper Rolls are flexible and available in the market in many sizes. These machine rolls are available in the market in pure white color and admired by the customers for easy printing. In addition to this, these machine rolls are finely prepared and checked by professionals for several times on numerous quality parameters. Safe from heating problem, these POS Thermal Paper Rolls are admirable in quality and can be obtained from the market in many specifications. These paper rolls are excellent in finishing. Our experts make these rolls by following global rules and guidelines. We supply heat resistant paper rolls in the market in safe packing. Safe from heating problem, these Blue Thermal Paper Rolls are admirable in quality and can be obtained from the market in many specifications. These paper rolls are excellent in finishing. Our experts make these rolls by following global rules and guidelines. We supply heat resistant paper rolls in the market in safe packing. Best in quality, these Green Thermal Paper Rolls are excellent in working and appreciated by the clients for longer life working. These thermal paper rolls are available in the market in multiple colors. These rolls are developed under the guidance of experts. Moreover to this, these paper rolls are tear proof. 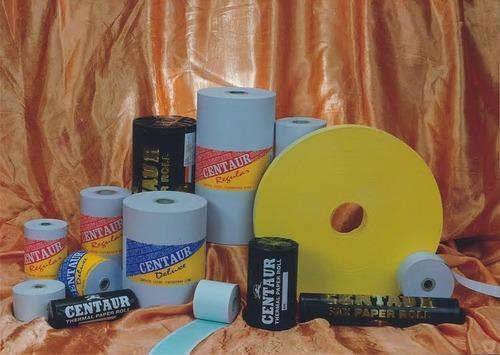 Our firm offers these Colored Thermal Paper Rolls in the market in many colors and sizes. Quality checked these rolls are superior in working and widely demanded in schools, colleges and craft work. Fade resistant, these rolls are eco friendly in nature and offered to the customers in safe packing. Moreover to this, these paper rolls have longer life. Safe from heating problem, these Pink Thermal Paper Rolls are admirable in quality and can be obtained from the market in many specifications. These paper rolls are excellent in finishing. Our experts make these rolls by following global rules and guidelines. We supply heat resistant paper rolls in the market in safe packing. Perfect in width, these BPA Free Rolls are made under the guidance of experts. In addition to this, these labels are reliable and safe to use. Made with the use of eco friendly material, these labels are best in quality and offered in the market in complete safe packing. Additionally, product labels are light in weight. Plain Thermal Paper Rolls are available in different length and sizes. The rolls are made from high quality raw material to enable quick payment of bill. Apart from these rolls are used by iping machines for the purpose of recording the transaction. They are offered at affordable prices.